The funding of the projects may come from direct contracts with industry or though competitive calls at national or international entities (EU, Spanish Ministries, JTIs, etc). 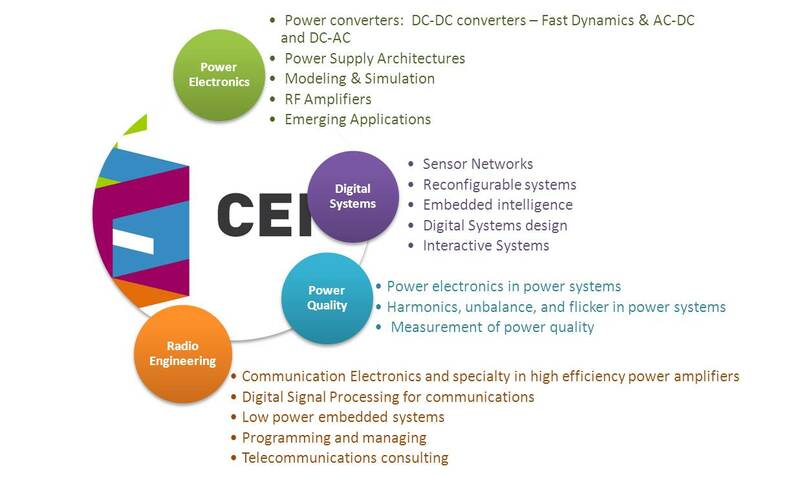 The main research lines are: power electronics, digital embedded systems, power quality and radio engineering. The first one is focused on power supplies and energy systems used in TIC, aerospace, transport and medical applications. Some specific topics deal with low-voltage output systems, magnetic components modelling and design, piezoelectric transformers, contactless energy transmission and dynamic energy management in microprocessors. Main domains of the second research line are reconfigurable systems, sensor networks and heterogeneous systems consumption modeling and estimation. The line leans on applications such as domotics, multimedia systems and embedded systems. The third line is focused in the modeling of nonlinear loads and the analysis of the propagation of the harmonics, the interharmonics, and the flicker that they produce. Another topic concerns the measurement of these perturbations and their statistical analysis. The main research lines of the Radio Engineering Group are the following few ones: Communication Electronics and specialty in high efficiency power amplifiers (RF and microwave circuits), Digital Signal Processing for communications (over DSP and FPGA, TI, Analog Devices,Low power embedded systems, Programming and managing of Unix (Linux) and Microsoft Windows servers: PHP, PERL, PHYTON, C#, Java, .NET, etc., and Telecommunications consulting.